In much of the Arab world, women's participation in the labour force is the lowest in the world, according to the United Nations, while women in politics are a rare breed both in the Middle East and North Africa. And just one step behind in the west. We all look forward to the day when a beautiful woman no longer has to wear a burqa or a headscarf or cover all her body for fear of inciting male passions,but when you walk around some Sydney suburbs you realise that the day is a long way off.You never see a muslim holding a woman's hand in public or putting arm around her.Only we infidels do that. "Two steps behind" doesn't even BEGIN to cover it. 2 steps physically, and a world behind in every other way we can imagine. Agreed Boods. Sad but true. It's the same here in Melbourne. That is for sure, sad but true.....those bastards! Women the world over are treated unfairly. Women used to be revered above men. It is far past time for ALL people, male or female, regardless of race, creed, or wealth to be treated with equal respect, equal rights, and equal pay. Just do it!!! See no hope for Arab women in future, saw a photograph of Saudi women in the 50s and 60s, they didn't cover their body then, they looked beautiful and natural. All this crap started after the country got rich with oil money, when men got more "holy" and enforced un natural laws. if Islam got modern instead of having 'holy than thou' attitude things will get better not only in the muslim world, but for others on this planet. Sadly we have a long way to go until women are going to receive the respect they deserve. Let us American women face reality. This is exactly what the Teapublicans are working towards. If there is anyone out there, especially conservative women, who believe that this 'abortion' issue is about saving babies, you are delusional. You must find out who stopped payment on your REALITY CHECK. Hypothetically, if the ultra-right was capable of achieving their goal, does anyone actually think it would stop there? This abortion issue is only a step in the 'total control' of women. It would never end, until they get us all back in the kitchen with our apron pinned tightly. You are correct, but, it's imperative that we comprehend why. When the Arab world started making money from oil and the people in general, demanded a better life, computers and other modern equipment brought in knowledge of the outside world. With that knowledge, the women started to recognize that they were not as free as women in other countries and THAT scared the men to death. What is the best way to 'nip this problem in the bud'? Bring back old laws, under the guise of religion, _We won't just stop them trying to improve their lifestyles, we'll take them backwards. Reminds me of the joke where Barbara Walters returns to an Arab country only to find the woman walking 10 steps ahead of her husband. Astonished, Walters rushes up to the husband and asks him if there's been some cultural revolution. He says, "No, land mines." Not just top-down change but also bottom-up: "changing entrenched patriarchal mindsets and shift from attitudes and beliefs that focus on women�s reproductive role to women�s productive and public roles." This requires a lot of education. And passing the IVAWA (International Violence Against Women Act). Pathetic!... I live in Australia. My ex next door neighbor does too but I often watched in disgust as he and his wife (I presume) return from a shopathon. His wife, clad in black, face and all, walked 8 paces behind, carrying loaded bags of groceries in the red hot sun. Fortunately I am not a violent person so, temptation waived, I did not throw stones at the a**hole. Can not reason with lunatics, hense we have to nuke them all..collateral damage but..hey..humanity requires it. They are totally nuts and dangerously so. ;) As are all relgionists..symptoms of insanity people..the norm is nuts. :) Welcome to Cahnahdah eh..:) Middle eastern males learned that walk behind woman does all the work from Injuns..global trade..precolumbus bull hooey..all these psychotic fracken cultures..geez..
We still have a long way to go baby all over the planet. Here the women walking a step ahead. 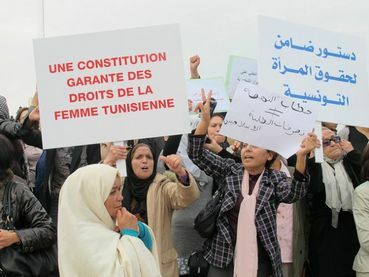 We Cant Change the Arab world.And it might take A decade or two for woman in Arab countries to take two step in Advance. To say such a thing means you have absolutely no idea what you are talking about. Noted. Thanks Cal for sharing this sad news! Sadly until religion gets out of politics and there is a fundamental shift in the Arab culture thinks are not going to change for women in the Arab world. There are many women in the west who like to think they are free but until women stop buying into the sterotypes of what is the perfect shape, the perfect look, stop altering their bodies to achieve what they perchieve to be perfection then thay are just as dominated as their sisters in the Arab world. Humans have made this such a sad World. Italians are just about as bad. There are 3 Italian families living on the same road as me and the wives always walk at least one step behind their husbands.